This tester is specially for the measurement of leather and fur softness, in order to understand the same or same package of leather soft hardness testing whether uniform, yi ke piece of leather, each part of the softness difference. (detection technology integral solution providers) is located in Dongguan -the south of China,specialized in researching, manufacturing and selling the test equipments. Continue its advanced designtechnology and concept, excellent technology of producing and outstanding system of quality management;providing the enterprises and the quality inspection agencies with high class products. All products meetthe International testing standard. 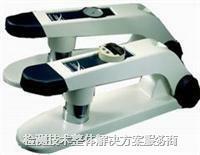 Meanwhile, we provide customer with complete solutions of laboratory.